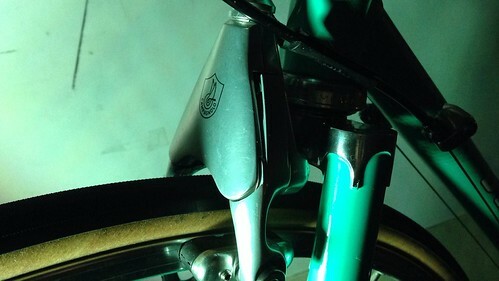 The legendary Campagnolo Delta brake was introduced in the mid-1980s on Campagnolo’s two top-tier gruppos, Record and Croce d’Aune. The Delta’s monolithic aluminium faceplate is iconic, one of the most recognizable components in the last 40 years. But not many people actually know what lies behind. 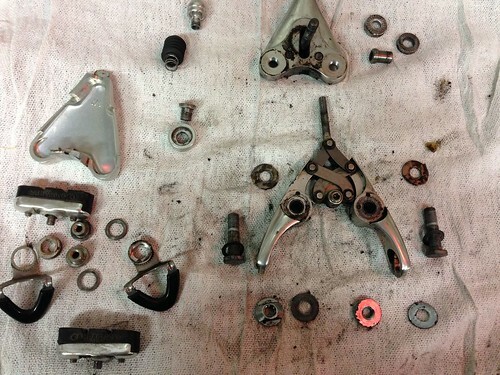 I recently received a bike scheduled for a “full overhaul”. 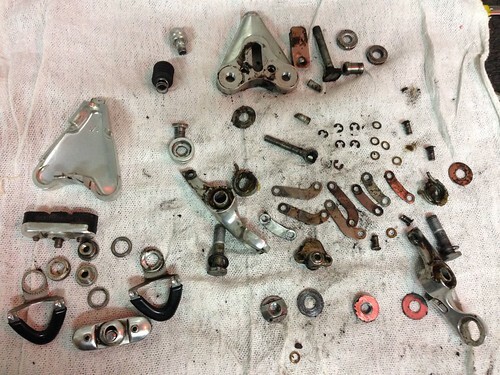 In my shop’s dialect, that means that if it can be disassembled and cleaned, it will be. Every bearing, every bolt. I saved those Delta calipers for last. You can follow the progress in the photos. Once I got to the c-clips holding the linkage arms together, it was definitely down the rabbit hole. There were actually 5-6 variations on the design. The first production versions were recalled due to a flaw that could cause the brake to fail outright (and you thought that it could only happen to SRAM and hydraulic brakes?). The one I worked on was a late Record version with the improved internal fittings and modified mechanical advantage. It was noted as being a dependable item once properly adjusted. No one actually claims that Delta brakes are powerful, but easy to modulate and progressive are phrases frequently applied. 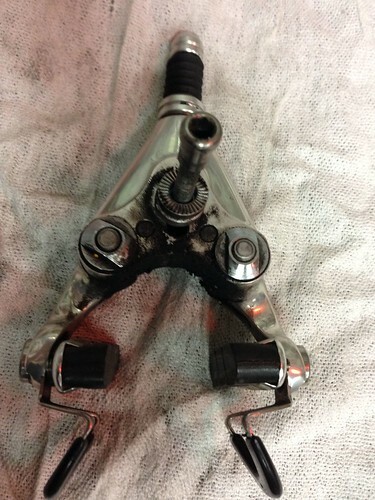 Once removed from the bike, you’ll note that the mounting bolt slides vertically in the caliper. 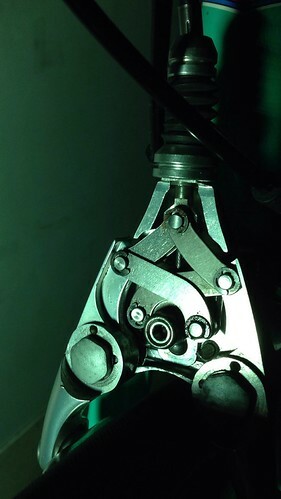 Thus even though the distance to the rim can be adjust by sliding the pads in the lower arms of the caliper, the whole caliper can be raised or lowered to tune the tyre clearance under the caliper. Ideally, you’d want the caliper to sit somewhat low to favour the mechanical leverage of the arms, but in this particular case I found that the caliper had been positioned too low. The underside of the caliper casing bore scraps from the tyre. 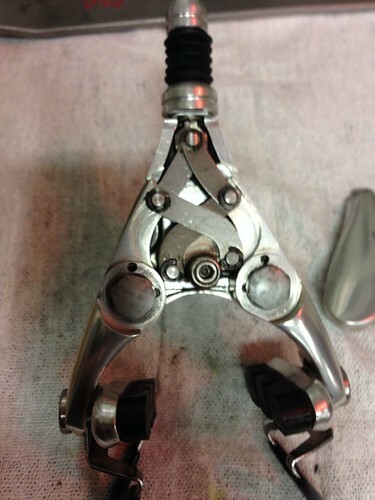 Also at the backside of the caliper casing, you can see a pair of nuts that fix the arms main pivots. Those will need loosening before you can remove the pivot bolts, but be careful because the wrench flats are quite shallow. It would be easy to slip a wrench and mar the nut. Don’t loose the thin knurled washers. Now the pivot bolts can be removed with a 12mm wrench. 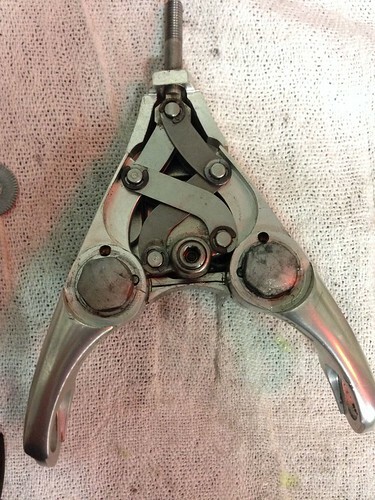 The return springs are housed in a recess on the back side of the caliper arms. Careful removing the arms so that pieces don’t catapult out from the released spring tension. Ooo goody, more washers. Another unusual feature is that the springs anchor against steel inserts that slip in from the back side of the casing through circular holes. Without the tension from the arms’s springs, these small pieces just fall out. The pieces are little cylinders with a hook to catch the spring. I knew that they’d be a bother to align when I’d eventually reinstall the arms. 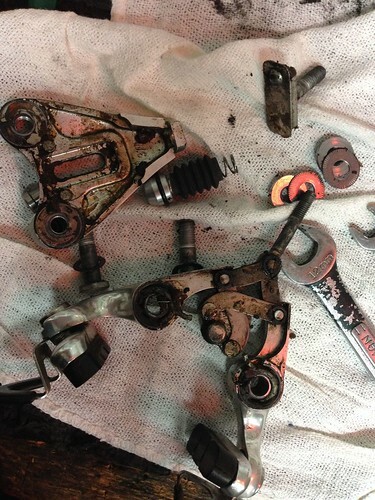 Now I have the brake proper gutted, but I’ve still the linkage mech to disassemble. Just to be certain, I drew a little diagram as a roadmap to guide my way back. There are eight linkages, four in front/four in back. 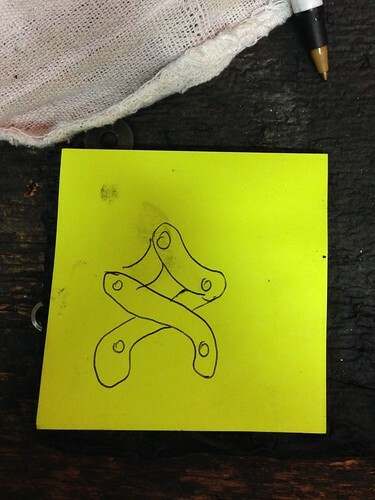 Each linkage is separated from its closest neightbor by a paper-thin brass washer. There is one thicker brass washer that spaces the lower front outward linkage from cable anchor piece. All of these pieces are held onto steel pivots by tiny c-clips. 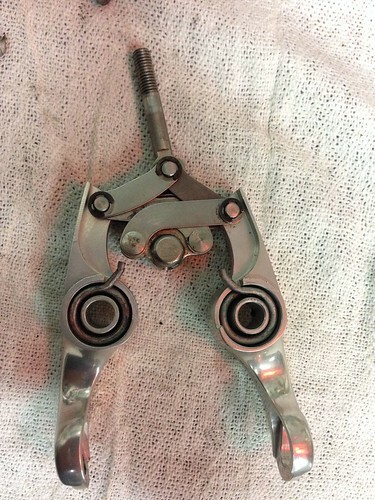 If you counted every individual piece of a Delta caliper, including the two o-rings that are missing from the barrel adjuster of this example, there are 76 pieces. Never has mediocre performance been so complicated. If you’re really curious, click on the photo below to go to my Flickr, where each part is notated. That old grease was probably 25 years old and had hardened to the consistency of expired cream cheese. Now I clean everything spotless and lubricate with fresh grease. This is easy & mindless if it wasn’t for the risk of losing one of those ridiculously small bits. 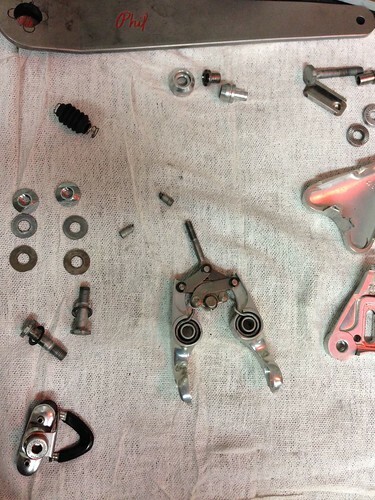 Reassemble the linkages, with all the washers and c-clips. With the arms face down, insert the return springs. More grease. 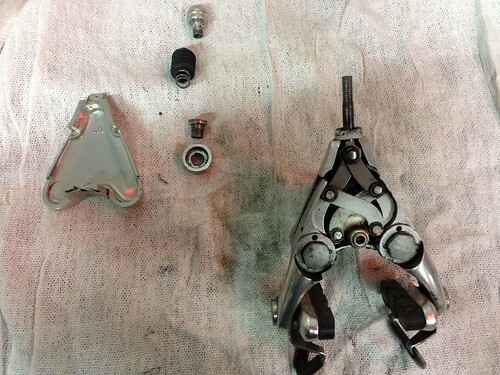 The hardest part of the reassembly is getting the caliper arms and their springs back into the casing while the mounting bolt and its anchor are loose within the slot of the casing. So much fun. In the end, all is clean and moves smoothly. The one odd tool that a Delta brake requires is a 3.5mm Allen wrench to tighten the set screw that anchors the brake cable. The cable exists the anchor just above the tyre tread, so you need to cut the cable quite close. Or you can lightly tighten the cable and test the lever throw, mark the cable just below the anchor, and them remove the cable so you can cut it. If you can gently coax the cable into the anchor piece again without fraying, almost no cable will be exposed. 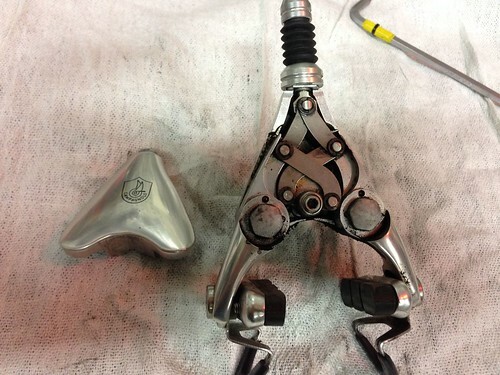 Having completely rebuilt those two Delta brake calipers, I almost have a certain fondness for those diabolical mechanical monstrosities, sort of like a Stockholm Syndrome for bicycle mechanics. But then I remember that SRAM Red calipers weigh a touch more than half as much, are more powerful, work with a full range of rim widths, use readily accessible cartridge brake pads, and have a working quick release. I will concede that those Deltas sure look pretty.